Music Program Director Nancy Jo Snider, ‘cellist, educator, and administrator, is a full-time senior professorial lecturer in the Department of Performing Arts. A multi-faceted career is “de rigueur” for artists. 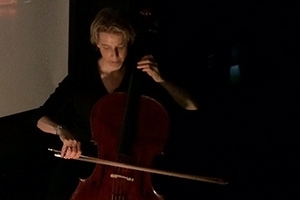 Playing my ‘cello in everything from period instrument performances of French Baroque music at the Opera Royal in the Palace of Versailles, to avant-garde solo playing with a Czech theatre company in South Africa, is all part of a day’s work. The joy of sharing the training and knowledge that has made this possible is what informs much of my teaching. Additionally, my teaching philosophy remains grounded in meeting my students where they are and helping them to their appropriate next step. Organization and communication are essential to juggling such a rich life, and it is here that my administrative talents are put to the test. But directing a program is not just about these details. There is a constant striving for excellence in the AU Music Program that requires vision, leadership, and the ability to engage all of the program’s components to keep it moving in a positive direction. The two E’s: espresso and e-mail. Meetings with faculty, my Director’s Musicians of Accomplishment, other students, and members of the community to discuss new Music Program and Department of Performing Arts ventures and options for upcoming performances. Time to teach University College Understanding Music, an introduction to musical language, to a group of 15 students. I love having the opportunity to share something I am passionate about with those who are also interested and to see their understanding grow as a result. That is the best! Afternoons are spent teaching ‘cello lessons and directing the chamber music ensembles. The ensembles perform around the DC area, and we always want to be ready for the next performance. Student advising is an important part of directing the Music Program. We serve hundreds of students, and I want to make sure all of them reach their goals after graduation—whether that is attending graduate school, performing, or entering the work force. The best of our music majors are competitive with the best majors anywhere! Time to exercise—either going biking, swimming, walking, or visiting the gym. I make time to practice in the evening, typically 15 to 20 hours a week. Reading the novel du jour. I’ll read (almost) anything, but particularly value the classics. Proust, Faulkner, and Joyce are my top three favorite authors. I also have a deep connection to the novels from the American South and follow the Booker Prize winners with special interest. My days also include rehearsals and performing (or attending performances). There is no typical “day in the life” for a teaching musician, only the certainty that the day will be very full with all of the wonderful opportunities we are so lucky to have.